Exciting News From the Equiparts Team: We Have a New, Informative, and Dynamic Website Specifically for Drinking Fountain, Water Cooler, and Bottle Filler Units and Parts! So Why is This New Site So Exciting? This site is chock-full of all of the hydration station information you need to make an educated purchase! Easily find out if a unit will suit your needs. Product information and features like Manufacturer, Manufacturer Number, Installation Type, ADA Compliance, Finish, Filter Inclusion, GPH, Vandal Resistance, Operation (Manual or Sensor), and Shipping weight are listed. Then, there is a description of the unit that includes differentiating features, how it is installed, its warranty, etc. All available options for the unit are also listed, such as the recommendations from our manufacturers like Elkay, Oasis and Haws regarding the best installation locations. Click this link to view an example product listing. 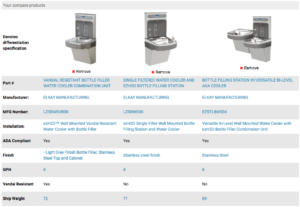 Easily compare product features of water coolers, bottle fillers, and drinking fountain units side by side-by-using the “Add to Compare” function. Learn how to use this tool step-by-step on our ‘How to Compare Units‘ page, then try it out for yourself on any category page. Main Navigation Bar: The top or main navigation bar of the site differentiates units and parts by type (Water Coolers, Drinking Fountains, and Bottle Fillers). Then the drop down menus lead you to more specific categories like Brand or Type of Unit. Search Bar: The search bar is a great place to find specific units by part number, manufacturer number, or other specific attributes. Left Navigation List: The navigation list located on the left is a great place to search for units based on what location they will be installed in, or other attributes you desire. Click any single check box to narrow your search. Every unit has a resource section to the right of the description which contains links to various helpful items like the Unit Spec Sheet, Parts Breakdown, or User Manual. Some units even have links to How-To Videos. Looking for a part for your drinking fountain, water cooler, or bottle filler but not sure what to search for or what the part is called? Send us a photo using our contact form, and one of our drinking fountain specialists will get back to you with an answer! On Equipartsdrinkingfountains.com, we use high quality images and dense product information, with more information from a knowledgeable product specialist only a phone call or quote form away. Not only does our site supply you with high quality and up-to-date information about the hydration station parts and units we carry, we also have a strong, customer service oriented team that knows our products well. We strive to stay informed of our products with frequent visits from our manufacturer reps to review product features and updates. Thanks for reading! Please share the new site on Facebook and help us spread the word!